ImTOO iPhone Transfer Platinum for Mac is a perfect iPhone managing tool for multimedia file transferring between iPhone, Mac and iTunes, all common video and audio files, online videos to iPhone format conversion and iPhone ringtone making. 1.Backup your iPhone music, videos, photos and books to Mac or iTunes without worrying losing content when accidents happen. 2.Freely transfer music, videos, photos and books from Mac to iPhone quickly and efficiently. 3.Convert CD to iPhone compatible video/audio files with great quality. 4.Designed to convert all kinds of video and audio files in order to let you play them on iPhone without troubles, such as WMV, FLV, MOV, MKV, AVI, MPG, MTS, RMVB, M4V, WMA, OGG, etc. 5.Function as a online video downloader and converter which can download and convert online videos from top online video websites. 6.Allows you to get iPhone ringtones out of any media sources: videos and audios in various formats. 7.Multiple portable players are supported, including iPhone 3G, iPhone 3GS, iPhone 4, iPhone 5, iPhone 5s, iPhone 5c, iPod Touch, iPod Touch 3, iPod Nano 5G, iPod Nano Chromatic, iPod Classic, iPod Shuffle, iPod Shuffle 4GB, iPod Video. 9.Built-in web browser enables you to view top popular online video websites, including YouTube, Metacafe, Dailymotion, Break, Vimeo, Revver, Blip, Vidilife and Stickam with ease. 10.Simply create new photo albums and playlists or delete existing ones on iPhone easily. 11.Provides a convenient built-in player for preview photos or videos shot by the devices and export them willingly. 12.Optimize the profiles when importing or converting multimedia files into devices. 13.Proxy server configuration allows you to configure the network to your preference. 14.Built-in media player, Proxy Server configuration and multi-lingual interfaces are offered. ImTOO PodWorks is the ultimate iTunes alternative and replacement software which can help you to convert and transfer multimedia files between iPod, iPhone, PC and iTunes. Features: 1.Transfer iPod/iPhone music, videos, photos, playlists and eBooks to PC quickly and efficiently. Synchronize iTunes with your iPod/iPhone is also supported. 2.Rip all contents in CD discs and convert to iPod/iPhone compatible files, transfer to the devices immediately after the conversion. 3.Convert videos and audios to media files playable on your iPod/iPhone and transfer to the devices right away. 4.Transfer eBooks in PDF and EPUB formats between iPod/iPhone and PC directly without iTunes. 5.Support connecting several different iPod/iPhone simultaneously and realize the file synchronization between these devices. 6.Fully support all iPod /iPhone models. 7.Read and export photos and videos shot by the device conveniently. 8.Provides optimized profiles to convert videos/audios to iPod/iPhone files. Automatically select a compatible profile for the imported file. 9.Simultaneously manage iPods and other iOS devices without conflict simply by drag-and-drop to share your files with other users. 10.Convenient and effective to add files into the application, import one by one or the whole folder directly. Create new playlists and photo albums freely. ImTOO iPhone Transfer Plus offers you an ideal way to backup music, movies and photos between iPhone and computer, transfer iPhone files to iTunes, convert videos/audios/CDs to iPhone files. Key features: 1.Transfer and backup iPhone music, videos, movies and photos to PC; backup iPhone content to iTunes library (iTunes 10 supported). Photos and videos recorded by the device are also supported. 2.Transfer music, videos, movies, photos from PC to iPhone. 3.Convert and copy video/audio files in almost any format to iPhone. 4.Access and manage iPhone content in Windows Explorer as a portable hard disk. 5.Fully supports iOS 7. 6.Supports all iPhone models: iPhone, iPhone 4, iPhone 3GS, iPhone 3G, CDMA iPhone 4, iPhone 5, iPhone 5s, iPhone 5c. 7.Connect multiple iOS devices at one time and transfer files between them by drag-and drop. 8.Transfer, edit and manage iPhone ringtones and eBooks in PDF or EPUB format easily. 9.Edit the ID3 tag info for multiple files simultaneously such as name, artist, album, and year. 10.Play iPhone videos/music with the built-in resizable media player. 11.High-speed file transfer from computer to iPhone, iPhone to computer and iPhone to iTunes. 12.Find music, videos and photos as easily as iTunes with Filter and Quick Search. 13.Create and edit your own playlists to manage and classify your music, videos and photos. 14.View files in 2 different modes: thumbnail and list. Add your own picture as the artwork in thumbnail mode. 15.Multilingual interface: English, French, Japanese, Spanish, German, and Chinese. 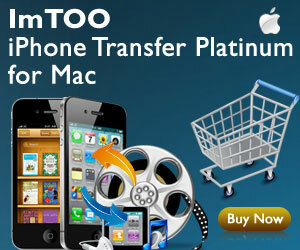 ImTOO iPhone Transfer Plus for Mac is an easy-to-use transfer tool for iPhone lovers on Mac. It performs as both iPhone Video Transfer and iPhone Music Transfer. You can quickly transfer music, movies and photos between iPhone and Mac, synchronize iTunes with your iPhone directly, convert and copy videos, audios and CDs to iPhone. 1.An iTunes alternative to backup movies, music and photos from iPhone to Mac or from Mac to iPhone without iTunes. 2.The featured iPhone manager for Mac can also copy iPhone movies and music to iTunes. 3.Rip and convert CDs and ISO images/IFO folder to iPhone supported formats and transfer them to iPhone. 4.Serves as an iPhone converter to convert movies and audios stored on your Mac to iPhone supported formats for transferring to iPhone. 6.Automatically identify and read your iPhone basic information including model, capacity, and serial number. 7.Title, album, composer, year and more ID3 tag information are available to be edited. Also supports edit ID3 tag information of multiple files. 8.Play and preview iPhone media files with the built-in player. 9.Manage iPhone files; search and check files; list and thumbnail mode. 10.Change album cover by adding pictures under thumbnail mode; rate and make comments on iPhone files. 11.Create and customize new playlists yourself, add artwork to your music and video. 13.Concise interfaces and multiple languages available including English, German, French, Traditional Chinese, Simplified Chinese, Japanese and Spanish. Designed for iPhone users as well as YouTube video fanciers, ImTOO YouTube to iPhone Converter is capable of downloading YouTube videos with super fast speed and converting them to iPhone videos successively. You can download and convert YouTube videos to iPhone videos in format of H.264 video or MPEG4 or to iPhone music in format MP3 or WAV. Its embedded YouTube video browser endows you to browser/search/download YouTube videos conveniently. 1.ImTOO YouTube to iPhone Converter is able to download a batch of YouTube videos in a considerable fast speed and then convert them to iPhone videos in format of H.264 video or MPEG4. 2.Extract audios from YouTube videos to iPhone music in format of MP3 or WAV. 3.Convert FLV videos on your local disk to iPhone videos efficiently with high quality remained. 4.Three ways of downloading YouTube videos are offered: right click on videos to start downloading, browser/search/download from built-in YouTube video browser or just drag and drop YouTube videos to the application. 5.Proxy server configuration is enabled to increase website visiting rate as well as provide more protections on network. 6.Global max downloading speed as well as task conversion priority can be configured to maximize the processing speed. 7.The convenient built-in YouTube video browser ranks YouTube videos to various categories for your reference and you can start downloading directly in the browser window. 8.Simultaneous downloading or converting tasks can be performed by adding multiple URLs of YouTube videos according to your requirement. 9.Multi-threading processing promotes the downloading and converting speed and enhances the performance to a great extent. 10.Auto-exit the application, shut down, hibernate, stand by system, or do nothing after the downloading/converting tasks are completed. 11.Multi-lingual interface is available in languages of English, French, Spanish, German, Japanese, Simplified or Traditional Chinese. 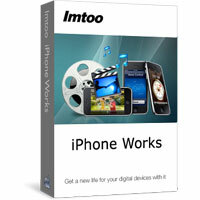 ImTOO DVD to iPod Suite SE, the 2-in-1 iPod video ripper and converter pack, comes with ImTOO iPod Movie Converter and ImTOO DVD to iPod Converter SE. iPod Movie Converter can convert just about any video file type, even high-definition (HD) video to iPod MP4 video. Unprotected DVD to iPod Converter can convert your unprotected DVD movies to iPod video/audio quickly and with exceptional quality. 1.Supports all iPod models: iPod nano, iPod touch, iPod classic, iPod shuffle, iPhone, iPhone 3G, iPhone 3GS. 2.Able to transfer converted files to iPod directly after conversion. 3.Resizable built-in player, adjustable aspect ratio (16:9 and 4:3), CD decoding, power management are all available. 4.Convert unprotected DVD movie or video segment to iPod video with the required resolution for iPod video: 320*240. 5.Split DVD title or video file into several iPod files with custom split size or time length. 6.Specify the output file size and get the corresponding video bit rate with the Bitrate Calculator. 7.Convert a file into multiple formats simultaneously. Rip a DVD movie with selectable subtitle/audio/angle. 8.Adjust parameters to set output quality: bit rate, video size, frame rate, sample rate, codec, etc. 9.Convert multiple files simultaneously at high speed with multithreading and batch processing. 10.Preview DVD movie or video file before converting and take snapshots of movie images. 11.Run tasks in the background to minimize CPU usage. 12.Set system to auto shut down, hibernate, stand by, or exit application after a task is complete. * ImTOO Software Studio as the publisher gives excellent FREE after service to buyers and FREE technical support to all trial users. And all users’ emails will be replied within a business day except holidays or weekends! So powerful in function, so affordable in price, so easy in use, so fast in speed and so considerable in service! Why not try it for FREE in the download? ImTOO Video Joiner is a powerful video joiner software which can add multiple video formats to join and combine them to one file. Compared with other Video Joiners, it supports so comprehensive video formats includingVCD, AVI, MPEG, MP4, WMV, 3GP, H.264/MPEG-4 AVC, H.264/PSP AVC, MOV, ASF etc. The AVI MPEG Joiner supports previewing the original video file, setting the Video Size, Frame Rate to get the perfect impression, and setting the Resize method. In addition, the intuitive interface makes ImTOO Video Joiner- the perfect video joining tool for both new and experienced users. ImTOO PodWorks Platinum for Mac is the ultimate iPod solution to all your ripping, copying, converting and transferring problems on iPod/iPhone which can transfer multiple media files between iPod, iPhone, Mac and iTunes, backup iPod content to Mac, convert CD, video and audio files to iPod compatible formats and move to devices for playback, download online videos to iPod, create iPhone ringtones from any audio/video file and etc. Features: 1.It is a fast and convenient multimedia file transfer which can move movies, music, photos, books from your Mac to iPod for enjoyment. 2.Apply this program to move all your iPod contents to Mac or iTunes for a solid backup. 3.This easy program is a great CD ripper make iPod compatible movies and music with ease. 4.This program also can convert ordinary videos/audios to iPod compatible formats. 5.ImTOO PodWorks Platinum for Mac can help to download and convert your favorite online videos from top online video websites to iPod. 6.Create personalized ringtones from any audio/video file and move to iPhone effortlessly. 7.Support connecting several different iPod/iPhone simultaneously and realize the file transferring between them. 8.Good support for any iPod /iPhone models: iPod, iPod nano, iPod nano 7, iPod classic, iPod shuffle, iPod Mini, iPod touch, iPod touch 4, iPod touch 5, iPhone, iPhone 3G, iPhone 3GS, iPhone 4, iPhone 4S, CDMA iPhone4. iPhone 5, iPhone 5s, iPhone 5c. 9.Fully supports iOS 4.2, iPhone 4 and iTunes 10. 10.Embedded with top rated online videos sites, including YouTube, Metacafe, Dailymotion, Break, Vimeo, Revver, Blip, Vidilife and Stickam to facilitate the online video watching and downloading. 11.Provides optimized profiles to convert videos/audios to iPod/iPhone files. Automatically select a compatible profile for the imported file. 12.Built-in media player, Proxy Server configuration and multi-lingual interfaces are offered. ImTOO YouTube to iPad Converter is capable of downloading YouTube and converting them to iPad video formats such as 720p H.264 HD video, H.264 video and MPEG4.You can also apply it to extract audios from YouTube videos to iPad music of format MP3/WMA or convert FLV videos on your computer to iPad videos. The particular built-in YouTube video browser helps you to search and download you loved YouTube videos with fast speed. 1.ImTOO YouTube to iPad Converter is an effective downloader which can download a batch of YouTube videos simultaneously in a considerable fast speed and convert them to iPad videos in format of 720p H.264 HD video, H.264 video or MPEG4. 2.Extract audios from YouTube videos to iPad music in format of MP3 or WMA. 3.Simultaneous tasks can be performed in downloading or converting YouTube videos. 4.Right click on YouTube videos to start downloading, browser/search/download from built-in YouTube video browser or initiate the downloading by directly drag and drop YouTube videos to the application. 5.Multi-threading processing feature greatly improves the downloading and converting speed. You can also set the max downloading speed to your preference. 6.The built-in YouTube video browser lists YouTube video resources by different categories, easy for searching and downloading. 7.Proxy server configuration is enabled to speed up the website visiting rate as well as provide more protection to the network. 8.Auto-exit the application, shut down, hibernate, stand by system, or do nothing after the downloading/converting tasks are done. 9.Multi-lingual interface is available in languages of English, French, Spanish, German, Japanese, Simplified or Traditional Chinese.